An easy to use continuous beam analysis program for the Microsoft Windows platform. This program can handle multiple span, and point, uniform, varying uniform and applied moments in the positive and negative direction. Other configurations are Cantilever left, right side or both sides and it also has a Hinge Option. This program is very simple to run. As one inputs the information the beam is drawn in real-time, this allows the user to visually view the input data. The output screen allows the user to add particular values to the plot and print them out. 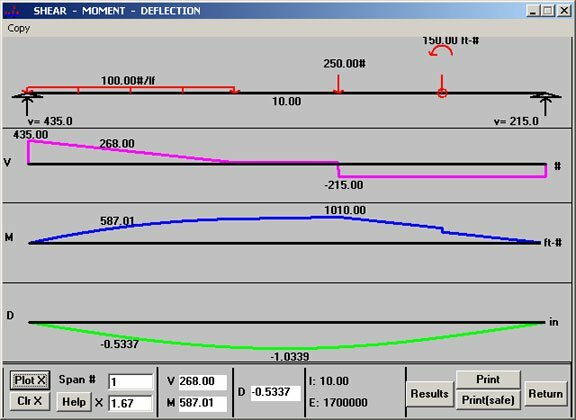 The results file has information associated with the analysis and shows the Max and Min shear, moment and deflection values and their locations on the beam. This is a direct stiffness matrix analysis method. This method requires that the material be linear elastic so the principle of superposition can be used. This principle is basic to the flexibility and stiffness methods of analysis. 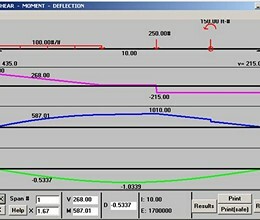 From this analysis I then derive the shear, moment and deflection data for each member. Except for the Beam Lengths being Fixed at 5.75, this Demo is Fully Functioning. * Beam Pro download link provides demo version of the software. Beam Pro has been rated 3.0 out of 5 points. A total of 19 votes cast and 0 users reviewed the software.